It’s worth noting, from the beginning, that a lot of the changes that we talk about in learning have been underway for a relatively long time. We market these changes with new terminology and enabling technology every few years, but many of these directional shifts have been underway for decades. One of these shifts has been a general movement from one dominant modality—instructor-led training—to an increasing number of options. Over the last several years, we have referred to our instructional recommendation of such approaches as blended or hybrid. We have then looked at mapping the various use cases for these modalities across the learner experience (LX), which we have also called a learning journey, a learning map, a personalized learning track, etc. Of course, there are nuances of difference between how we use these terms and many of those nuances prompt us to think or design differently. Have we factored in social learning? On-the-job learning? Reinforcement? I think this discussion seems particularly useful right now, at this point in the evolution of our industry, for a couple of reasons—it’s now easier to implement this type of strategy and learners are ready for it. TTA sponsored a research study looking at the learning experiences of 1001 learners over the course of a year. The researchers were looking at preferences but also at perceptions of efficacy. The results are very interesting in that they are a snapshot of change. The report shows the prevalence of instructor-led training, but, instead of showing disruption and displacement of that modality, it highlights the value of complementary strategies. Specifically, it shows that leveraging multiple modalities increases training effectiveness. We’ll look at a couple of the findings, but you can find the full report here. This chart is more interesting than it may appear at first. Yes, ILT is still a preferred training method, but this question allowed learners to identify multiple preferences (it appears that most identified 3-4 preferences). What’s interesting is the variety of potential preferences as well as the readiness of learners to include those modalities. If we compare what learners actually experienced during the course of the study with what they prefer, we find that some learners preferred modalities that they did not experience or have access to. This might signal a curiosity for these modalities and/or a familiarity with these modalities in another context, such as marketing, Web content, etc. This comparison also shows that learners’ exposure to multiple modalities definitely led them to make to more varied and specific preferences. One the key takeaways here is that learners want new modalities. Another interesting finding of the study is that using more modalities improves training effectiveness. 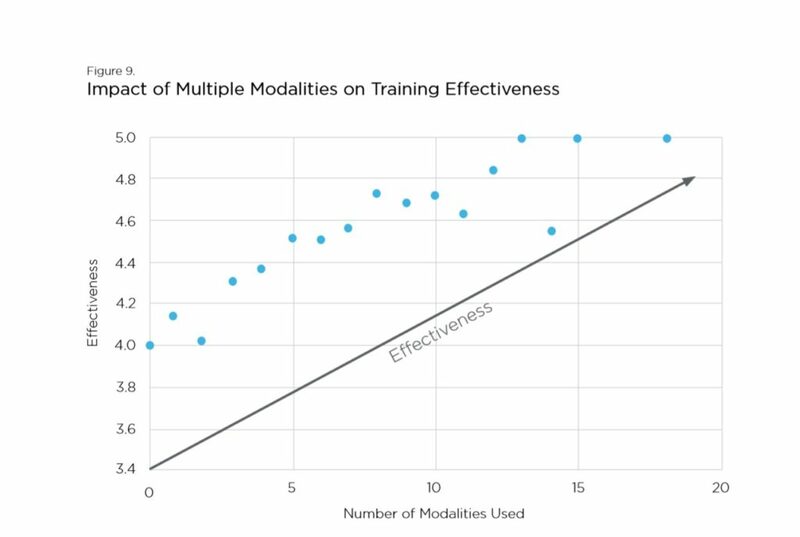 Although learners rated effectiveness fairly high regardless, there is definitely an improvement as more modalities are introduced. Other aspects of the research answer the question of which modalities are perceived as most useful—it isn’t surprising that the answer correlates to their experience. What’s striking with this particular conclusion is simply that the sheer variety and availability of options leads to increased effectiveness (regardless of other factors, such as the appropriateness of the modality for the training topic). Do programs that offer more modalities also have more strategic uses for those modalities? Are such programs addressing a broader set of needs in terms of learner experience? I think that the likely answer to both of those questions is yes. So, if learners have an interest in and appetite for new modalities, and if the research tells us that this improves training effectiveness, the task of the learning strategist or the learning experience designer becomes even more interesting. The task isn’t to find out what learners want and then simply deliver it as a transaction. The task is to map out the right set of experiences (and options), available at different moments in the learning lifecycle, to both engage and increase efficacy. Consider this hypothetical, hybrid strategy for a leadership curriculum and let’s look at it from the perspective of learner options and modalities. Readiness for the program might be evaluated through an online assessment—it may have adaptive features, or it may be more of a diagnostic. Flipped classroom strategies may serve up relevant videos or microlearning. These may be curated and recommended based on the results of the assessment. Let’s design the classroom experience with gamification and simulation exercises, cohort learning, and micro-/huddle delivery. What if we are able to gather real-time data on learner progress and pivot our facilitation when necessary? Maybe we are using collaboration technology to connect remote learners. We leverage a reinforcement and performance support platform to scaffold the transition to the work environment and provide ongoing impact. Our cohort matures into a community of practice and participates in coaching future leaders. Even at a high level, we can see that such an approach leverages a dozen or more of the strategies learners have identified as preferred. Hypothetically, taking the assumptions of the report, this hybrid experience could also impact the effectiveness rating by as much as 15-20%. Of course, there are many ways in which this is a simplification. And, while most any practitioner will recognize that learning is an experience and not a single event, the reality is that such programs are still the minority. The big opportunity is that, because learners are ready for it and because the technology is more readily available, creating those experiences can finally become the primary focus of our work.